Dedicated to the one I love: Simon, Grace and David in The California Dreamers. A BRAND new jukebox musical which made its debut earlier this year arrives in Redditch on June 1. The California Dreamers show pays homage to the iconic artists who made their home in ‘Laurel Canyon’, a small neighbourhood nestling in the foothills of Los Angeles. The show features a live band of professional musicians from around the region, including Simon Foster who now lives in Redditch . 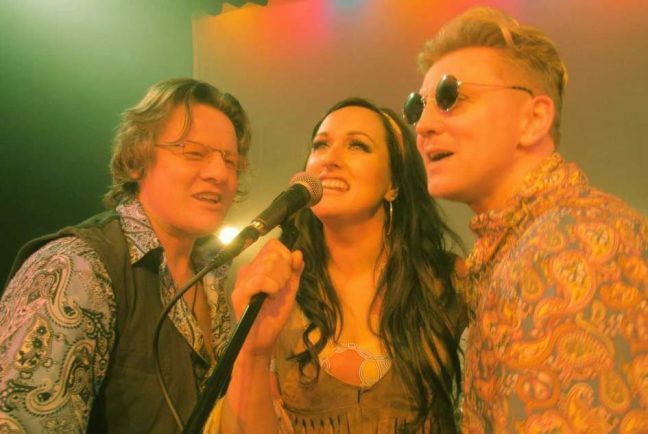 As well as featuring million selling hit songs the show also includes authentic archive film footage to recreate the atmosphere of the hippy 60s. The show presents real life stories of the events which rocked the world and the relationships that inspired those who lived in the Canyon to write and produce the classic hits that defined a generation. The show is co-produced by Grace Palmer and Tim Mansell. Grace, who now lives in central Birmingham, will take to the stage as lead female vocalist, alongside Simon and David Barnes. Simon Foster has been a familiar figure on the Birmingham music scene for some years, having starred in several acclaimed musicals while David was on Team Ricky on BBC’s The Voice UK in 2016. The show is at the The Palace at 7.30pm on Saturday, June 1 and tickets are £20 from the Palace box office in person, on 01527 65203 or at www.redditchpalacetheatre.co.uk.